You’ll love this brilliant recipe hack for making crunchy, low-carb tortilla chips. 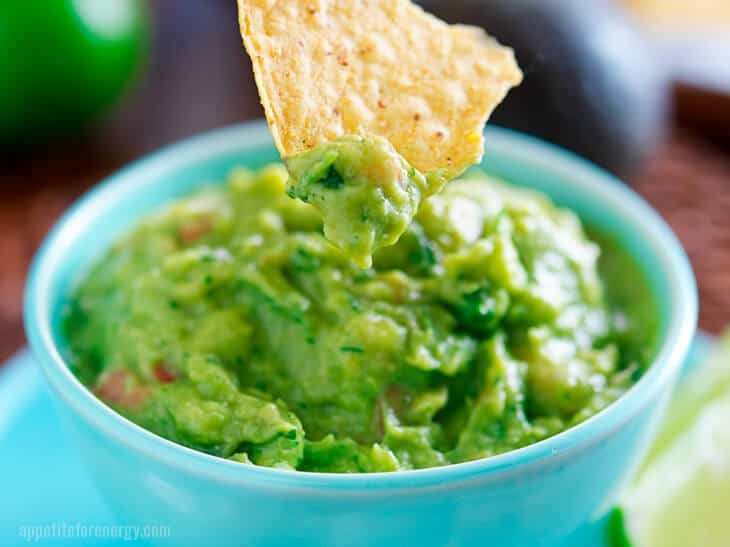 Dip them into guacamole, serve with hot, cheesy, beef nachos or top with your favorite cheese. I’m not sure I can really call this a recipe but I had to share this brilliant idea for making low-carb tortilla chips. Get your hands on some low-carb tortillas and they are a cinch. 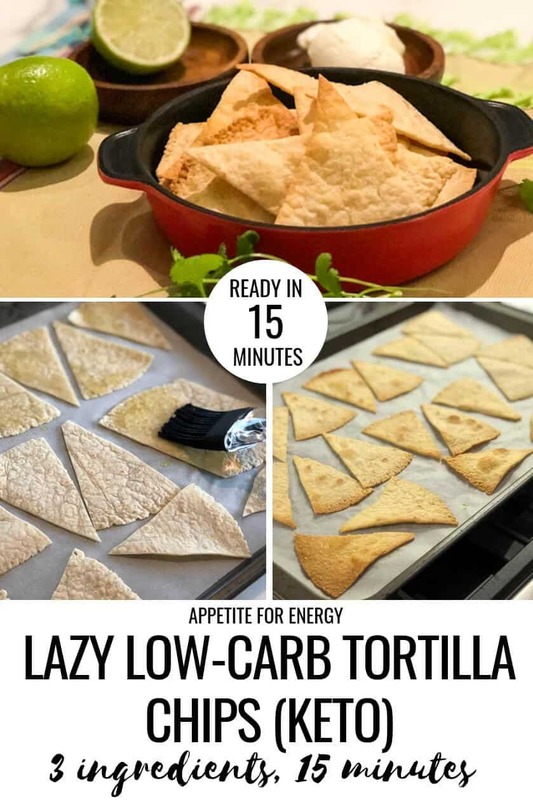 Healthy Low-Carb Tortilla Chips are perfect for ketogenic diets and low-carb diets where regular tortillas chips are off the menu due to their high-carb content. 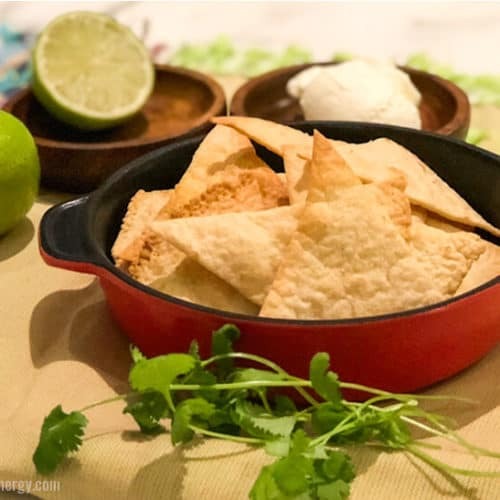 Make some homemade tortilla chips using store bought low-carb tortillas and enjoy that crispy, crack of chips that you miss on a keto diet. Ketogenic tortilla chips are perfect when you have guests coming over and you want to serve something low-carb with an antipasto, cheese & dip platter. Siete Foods Almond Flour Tortilla is grain free, however it is higher in carbs at 8g net carbs per tortillas. Let us know in the comments below if you’ve found any low-carb tortilla brands that you love! Start by pre-heating your oven to 350°F (180°c). You can also tear the tortillas up by hand for a more rustic look. Prepare a large baking sheet (you may need 2) by lining with parchment paper and lay the tortilla triangles out in a single layer. CAN I EAT TORTILLA CHIPS ON A LOW-CARB DIET? Regular tortilla chips are off limits on a low-carb or keto diet because they contain high amounts of carbohydrates. As carbohydrates are limited on a low-carb diet to between 20-50g net carbs per day, eating tortilla chips would blow out your daily allowance. There is, however, a simple low-carb alternative. Try making your own simply by baking some oiled low-carb tortillas in the oven at 350F (180c) for 8-10 minutes. 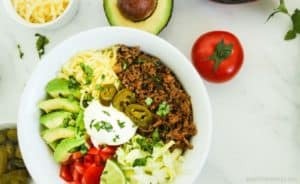 IS THERE A LOW-CARB TORTILLA? Yes, there are several low-carb tortillas available to purchase. Regular flour and corn tortillas contain 12-15g net carbs each so are not particularly low-carb. Store bought low-carb tortillas range from 3-6g net carbs per tortilla. Look for brands such as La Tortilla Factory, Mission, and Mama Lupe. If you want a store bought gluten-free option, try Siete Foods Almond Flour Tortilla which is grain free, however it is higher in carbs at 8g net carbs per tortillas. Maybe just for special occasions or on carb up days. If you want to make your own keto-friendly tortillas, check out the recipe for Almond Flour Keto Tortilla Recipe over at My PCOS Kitchen. HOW MANY CARBS ARE IN TORTILLA CHIPS? Regular store bought tortilla chips contain 15-20g net carbs per 28g (that’s about 11 chips). 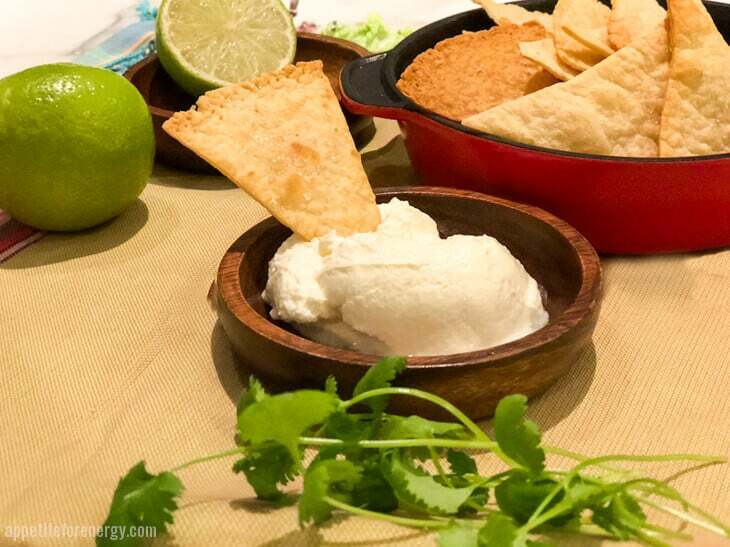 Our lazy, low-carb version has 6g of net carbs for one tortilla made into chips. 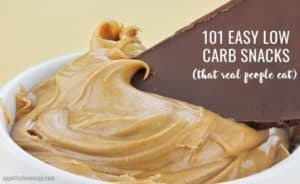 For more snack ideas, check out our post: 101 Easy Low-Carb Snacks (That Real People Eat) and download the FREE printable list. Looking for more fun low-carb snacks to make? 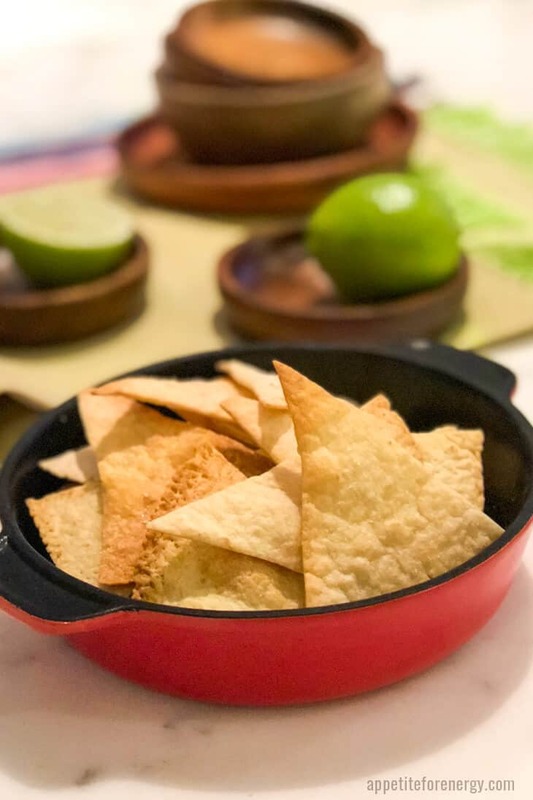 This recipe is a brilliant hack for making crunchy low-carb tortilla chips to serve with beef nachos, guacamole or as a keto cracker to have with cheese or dips. Tear up the tortillas into pieces or cut with scissors into triangles. Lay on a baking sheet in a single layer and brush both sides with the oil. Bake in the oven for 8-10 minutes until they have crisped up nicely. Enjoy with some guacamole, beef nachos, dips or cheese. This post was originally published in March of 2017, but was republished with step by step instructions and tips in October of 2018. Why is this article filled with pictures of corn chips? I know! It’s hard to believe – they are low-carb tortilla chips! You make them using low-carb tortilla wraps. That looks great I’m hungry for chips but did I read that there’s 28 carbs? For how many chips? The net carbs for one serve is the total carbohydrates less the fiber. This would be 28 less 19 which totals 9g. One serve is 1 and a half whole tortillas. I have updated the recipe! I have used the nutrition info for the Mission brand and I think this is the difference. I’m guessing you are looking at the Mama Lupe brand and they are lower in carbs than Mission. Mama Lupe has 3g net carb per tortilla while Mission has 6g net. If you can get the Mama Lupe brand then it’s a better choice from a net carb point of view. The Mission tortilla is 15% larger so that compensates a little! Oh I love homemade tortilla chips! These look amazing! 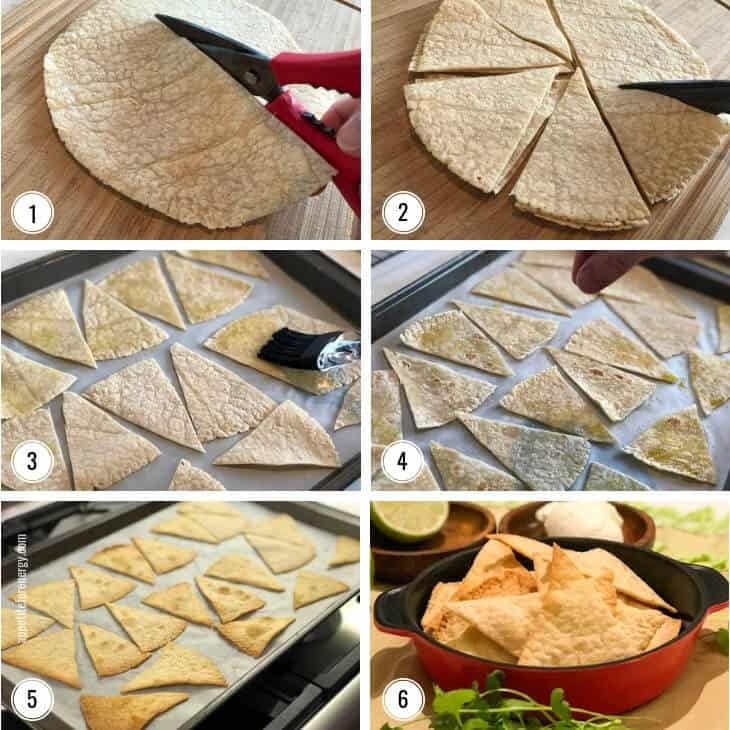 This is such a great idea for homemade tortilla chips! Definitely going to give these a try. 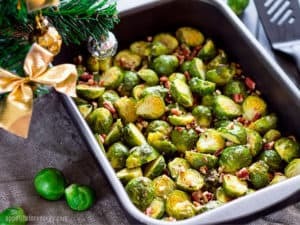 I love that they are low carb too! Going to pin for later! I hope you try them – they are so easy! It’s also a good way to use any leftover low-carb (or regular) tortillas before they go stale! 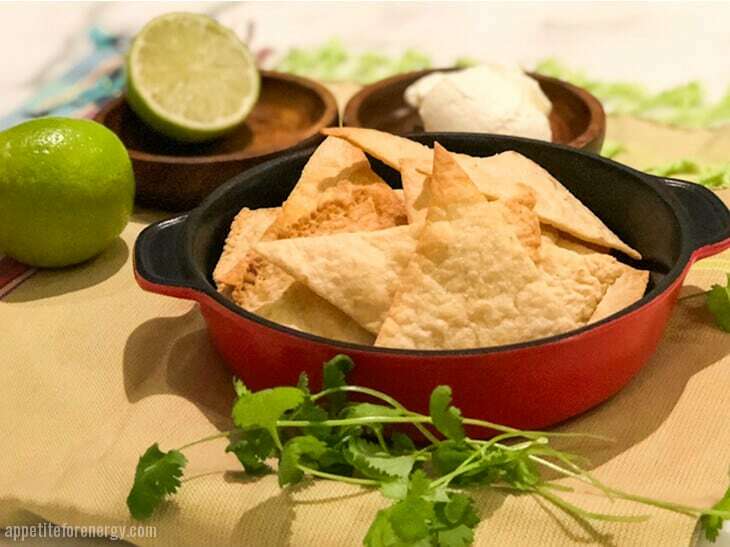 Tortilla chips are some of favourite go to snacks, I can’t wait to try this recipe! I am currently on a low-carb diet to loose some of the weight I have gained from eating out so much lately. I am so glad I found this recipe. One of my favorite indulgences is chips and salsa. Now I can have them on my diet. YAY!! Thanks for the recipe. 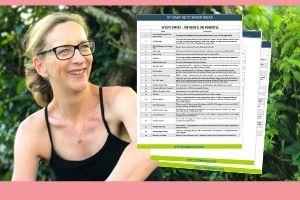 Enjoy and definitely check out some of the resources under our Keto Guides tab on the homepage. I followed your tortilla chip recipe with the La Tortilla brand and they were chewy not crispy… should I cook them longer ? Yes – try cooking them for longer, until they get crisp. The cooking time can vary a lot with different brands. Also, make sure to brush the oil on lightly as too much oil might also cause them to be less crisp. You could use an oil spray as an alternative. How long would you say they keep for? They will keep for a 2-3 days in an airtight container but they are best and most crunchy on the first day. I always hold out part of the batch and sprinkled with stevia and cinnamon. Makes a great dessert treat on Taco night! I’m in Atlanta, so not sure if these are available everywhere, but La Banderita low carb tortillas are big and soft and only have 5 net carbs. I was a fan of La Tortilla Factory’s low carb tortillas until I found these. They’re delicious turned into chips. What’s your favorite brand to use?? Or which brand You think has the best flavor?? I’d go with the Mama Lupe or La Tortilla Factory as they have the lowest carbs….flavors are similar!